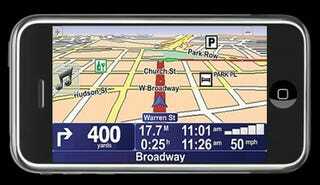 In an interview with TomTom spokesperson Yann Lafargue, French site Mac Generation hit on a few interesting tidbits about 3rd party navigation software on the iPhone. During the interview, Lafargue confirmed that there was a version of TomTom software running on the iPhone but he does not know if they will ever actually ship the product. You would think that the major reason for not shipping would be the clause in the SDK agreement that states "applications may not be designed or marketed for real time route guidance," but Lafargue insisted that is not a problem.